LAHORE: Senate Chairman Sadiq Sanjrani on Monday declined to take Prime Minister Shahid Khaqan Abbasi’s repeated criticism of the Senate elections negatively, saying Abbasi “is like an elder brother” to him. He also stated that he does not mind the negative comments that the PM has been making about the Senate elections. 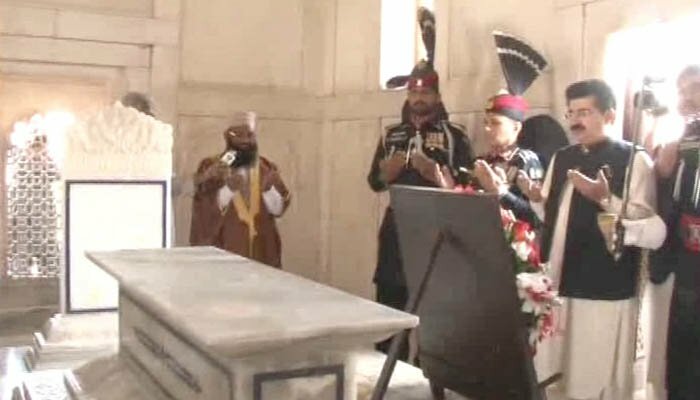 The Senate chairman was on a visit to Lahore where he paid his respects at Allama Iqbal’s tomb and laid a floral wreath on the mausoleum. He was presented a guard of honour upon arrival at the tomb. Speaking to media on the occasion, Sanjrani stated, “PM Abbasi is like an elder brother to me and can say what he pleases”. Earlier on Sunday, Senate Chairman Sadiq Sanjrani arrived in Lahore from Islamabad via train. He was received by Pakistan Railways Chief Executive Officer Javaid Anwar and Divisional Superintendent Sufian Dogar upon arrival. The railway officials thanked the newly-elected Senate chairman for choosing train for the journey.